Per the Texas Real Estate Commission, all individuals practicing real estate in Texas with an active license must provide written notice regarding information about brokerage services to their clients at the first legitimate talks with buyers, sellers or landlords. Typically, what agents will do is make it publicly available in their email signatures so it’s always a secondary thought and presented to the client every time you exchange emails. So how do agents go about hyperlinking their completed IABS to their email signature? It’s easy and in a few simple steps below we’ll show you how! The video above shows you how to accomplish this using DropBox, but the article below will show you how to accomplish this with Google Drive. It’s personal preference which you choose, but if you have a Gmail account already Google Drive will probably suit you best. 1. Get a Blank IABS From TREC’s Website. You can download one directly from this link – TREC IABS. This form comes with fields that can easily be filled-in and saved to your computer for later use! From here, take your completed IABS PDF and visit drive.google.com and login to your gmail account. Business or personal doesn’t matter as the email won’t be public. The images below show you exactly what we’re referring too! If done correctly, you should now see the PDF sitting within your Google Drive. From here just right-click the file you see and follow the prompts in the images below to get your IABS link. 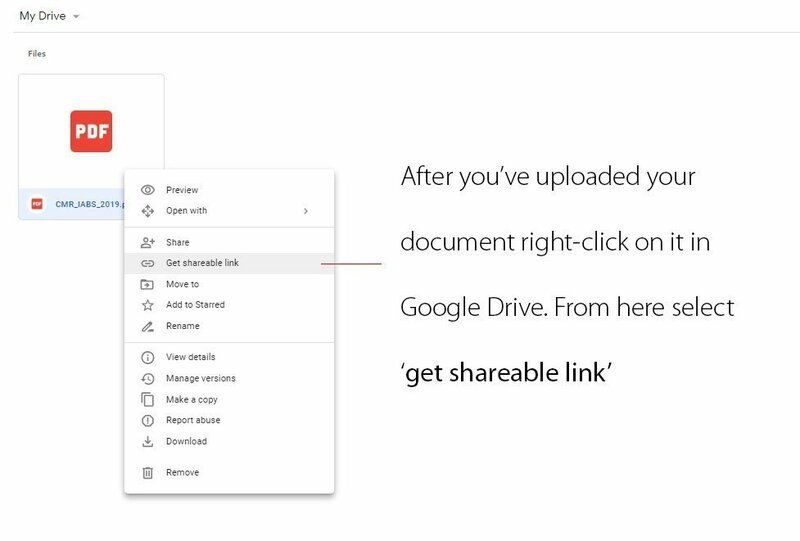 Once you’ve gotten this far and have enabled the ‘link sharing’ for this go ahead and copy the link that is provided just below this within your Google Drive. This is the direct link to your PDF which in now hosted via Google and view-able for anyone with that link! Easy! You can test ours – https://drive.google.com/open?id=1rnnZbDYmZn9xglXcdBwfC69vjZop5yIR. Voila! An easily accessible PDF for any and everyone to view online! Once you have the link go ahead and visit your email provider and visiting your settings where you can edit your email signature. All you need to do from here is include ‘Information About Brokerage Services’ and hyperlink this text with the link to your IABS hosted by Google Drive. Like so – Information About Brokerage Services. The same can be applied to TREC’s Consumer Protection Notice which is also required to be disclosed to your clients. Repeat these same steps with that and you will be TREC compliant in no time! Have an questions or issues – email us at agents@centralmetro.com or contact our Broker directly via 512.921.7537.